For most of the 19th century bicycles generally fell under a ‘one size fits all’ banner and were mainly built for adults. Men, women and children (mostly from the upper classes) all had access to standard sized frames, although there were exceptions to this such as the High Wheeler (aka the Penny Farthing), where the height and size of the vehicle were determined by the leg span of the rider. The invention of the ‘Safety bicycle’ in 1886 and then the Dunlop tyre in 1888 meant that cycling was safer and more comfortable. In the 1890s developments in chain driven mechanics and gears, new wheel sizes and frame shapes all enabled a cycling ‘boom’ with the latest ‘must have’ models flooding the market, for those that could afford them. These developments meant that old stock was sold off cheaply and was now increasingly affordable to working men, women and children. Bicycle manufacturers soon realised that there was a gap in the market specifically for those who wanted to buy cheaper, more basic bicycle models. Examples of this include Sunbeam, who in the 1890s had sold bicycles for £25-30, and by 1900 were selling models for £15, whereas up and coming manufacturers such as New Hudson were offering basic vehicles from 10 Guineas (£10.10) in the early 1900s. Between 1910 –1914, there were even some county councils within the UK bulk-buying bicycles and loaning them to scholarship children living in rural areas, thereby enabling them to travel to school in the local town. Vehicles specifically designed for children (and also favoured by those who did not feel comfortable on early bicycles) throughout the 19th century tended to be tricycles and quadricycles, which by their very design were safer and more child friendly. 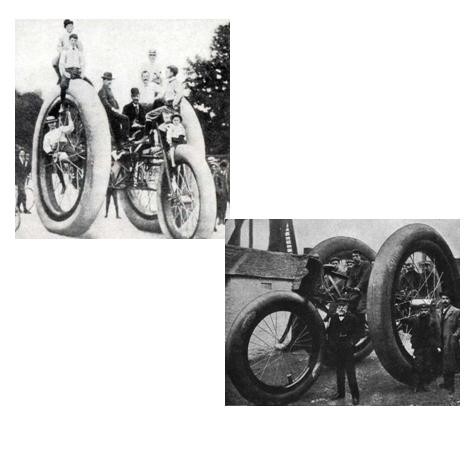 Even within these types of transportation there were variations, such as the tandem quadricycle (that allowed both rider and passenger to sit side by side) and Rudge rotary tricycle which used a central chain driven mechanism to drive the wheels, thereby making it faster. It wasn’t until 1916 that a specific child’s bicycle was created. By the 1920s bicycles were seen more as children’s toys or transportation vehicles rather than the novelty toy for adults that they had once been. 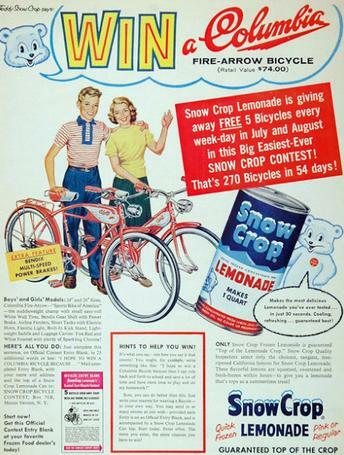 After World War II there was more of a design element to the bicycle, with many models of the 1950s having features in common with motorcars, motorbikes or even jet engines and rockets in order to appeal to children. While Tricycles and Quadricycles still remain well liked by adults and children today, their overall popularity suffered a decline. 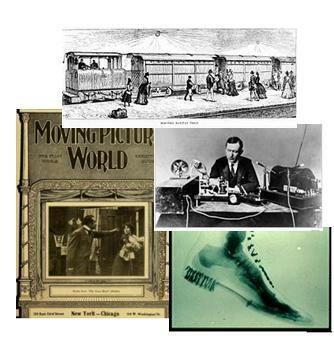 This was due to the ever improving developments in the bicycle that carried on throughout the 20th century, the advent of the child’s bicycle and the motorcar. Today throughout the world both motorised and non motorised quadricycles and tricycles are still used for tourism, transportation of freight, exercise, recreation and as children’s toys. Throughout the 19th century female fashion was also going though major changes. This was partly a response to (and impacted on) the popularity of recreational activities such as cycling. 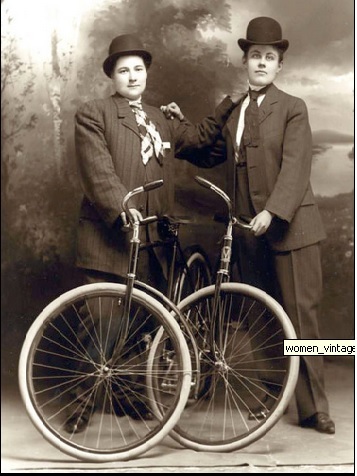 For women, the bicycle increasingly represented freedom of choice, liberty and mobility and new types of clothing were needed which allowed women to participate in such activities. One of the most notable changes in female dress occurred around 1851 with the introduction of loose fitting, ankle length, frill cuffed trousers that were worn with a knee length skirt and bodice. This design was thought to be influenced by similar fashions from Turkey and was particularly popular with women in America as well as the UK and parts of Europe. This new style of dress was greatly endorsed by the American feminist and rights activist Amelia Jenks Bloomer, which led to their nickname of ‘Bloomers’ (a name which they are still known by today). Unfortunately after a few intense years of popularity ‘bloomers’ faded out of the fashion spotlight. “protest against the introduction of any fashion in dress that either deforms the figure, impedes the movements of the body, or in any way tends to injure the health. It requires all to be dressed healthily, comfortably, and beautifully, to seek what conduces to birth, comfort and beauty in our dress as a duty to ourselves and each other”. The society advocated clothing which was plainer and more practical, making sports (and movement in general) less restrictive. This meant that by the 1890’s Bloomers were back in fashion, especially with the ever growing number of female cyclists, who found that they did not tangle in the wheels, cogs or chain mechanisms of bicycles, making cycling much easier. While popular with some, many viewed ‘bloomers’ as masculinising women which was very much taboo at this time. 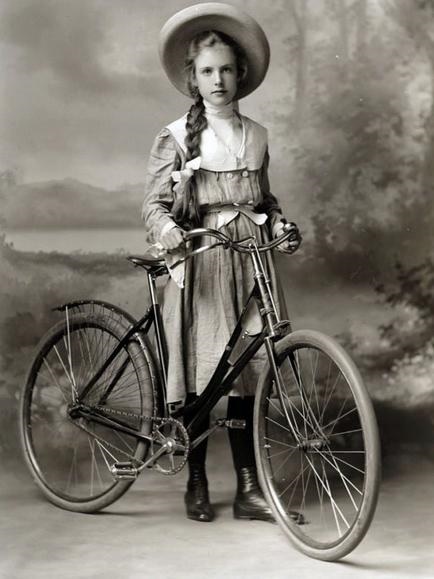 Religious quotations were used to justify this standpoint such as ” the woman shall not wear that which pertaineth unto a man” (Deuteronomy 22.5).Because ‘bloomers’ were very much popular with cyclists, cycling also became seen as a tool to masculinise women. 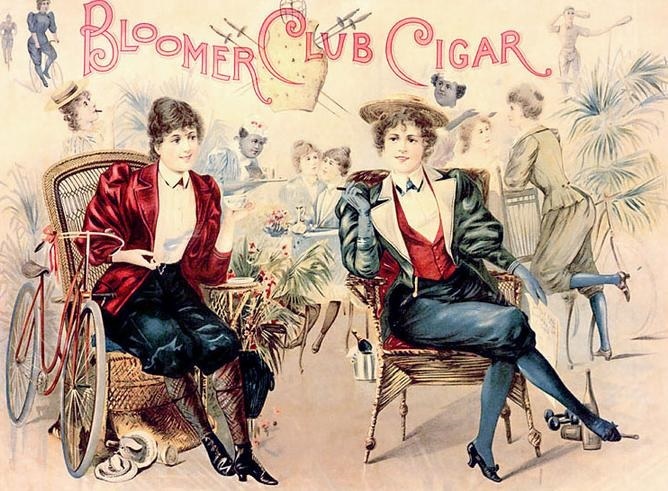 Many jokes and cartoons were published mocking female cyclists and those that wore bloomers, showing them undertaking manly pursuits such as smoking cigars! 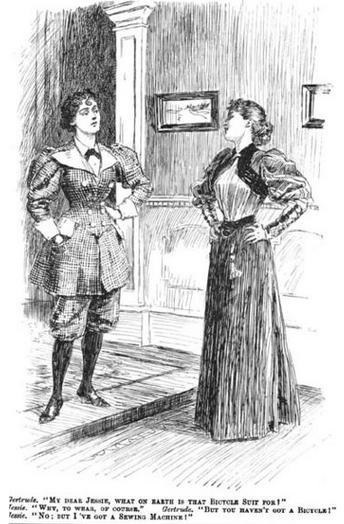 Women’s dresses were also changing throughout the 1890s; corsetry, stays and bustles were being increasingly ignored in favour of slimmer, shorter and more fitted dresses. Affordable mass produced tailored dresses also became popular at this time with sportswomen and working women. Cycling also influenced changes within men’s fashion and children’s fashion. This largely took the form of different trouser and jacket suit combinations, which were more fitted, streamline and had more pockets. 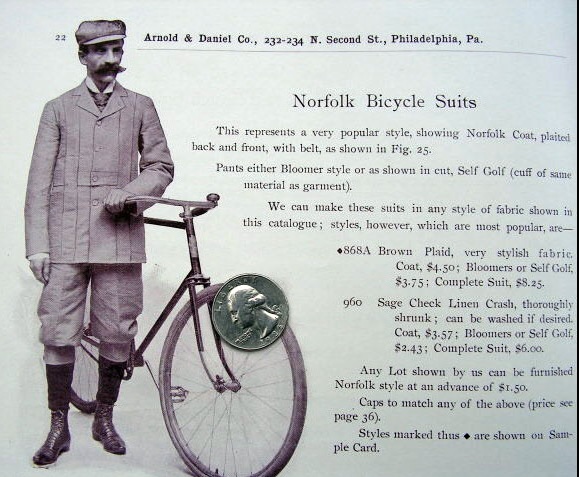 The Duke of Norfolk himself even influenced men’s fashion with his preference a suit style known as the Norfolk Bicycle Suit! Today cyclists are generally known for supporting environmental concerns. However in the 1890’s they helped play a role in the Socialist movement that was sweeping Britain. 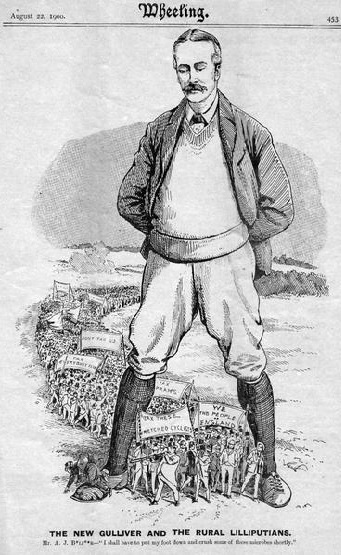 The Clarion, first published in December 1891, was the most influential Socialist newspaper ever to be published in in the UK, selling over 40, 000 copies in its first publication. As well as discussing socialism, it also published articles concerning general news, short stories and reader comments sections. In addition to this its members established good social links with each other through a variety of clubs and activities such as rambling, handicraft and children’s clubs. The most popular of these was the Clarion cycling club, established in 1894. The first trip undertaken by the club ( around Worcestershire) was published in the next issue of the Clarion and proved to be of great interest to its readers. 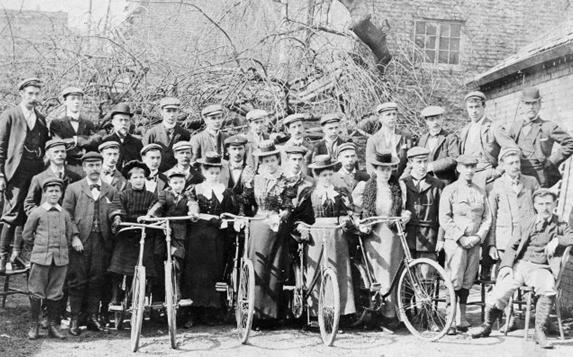 At its peak the cycling club had over 8,000 members. After 1895 clarion members could also access clarion clubhouses for low cost holidays, which made the cycling club all the more popular. Sadly, the arrival of World War I saw the membership of the clarion deterioriate, something which it never recovered from. Soon after the end of World War I, in 1927 the Clarion started being published monthly, fully closing in 1934. Since the concept of the bicycle has existed so too has the use of engines to aid its travel. Not long after the introduction of the Draisienne in 1818 plans for the ‘Cycle-motor’ were drawn that showed a velocipede with a steam engine attachment. However it wasn’t until the late 1860s/early 1870s that the Steam Velocipede was formerly produced by French bicycle makers Michaux-Perreaux. Until the turn of the century there were variations of this design produced in America, France and Germany. In 1900 the first motorcycle design (as we know it today, with the engine at the bottom of the frame) was produced. Developments continued throughtout the 20th century to produce both the modern motorcycle and the electric bicycle both of which are still popular throughout the world today. 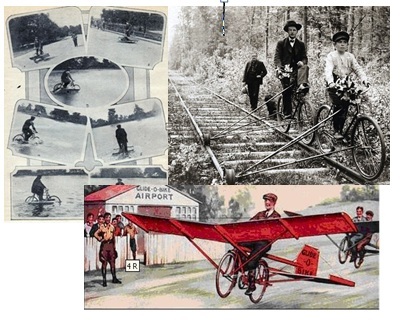 In the early 20th century there were also bicycles designed to travel on water, fly or be used on railway lines. 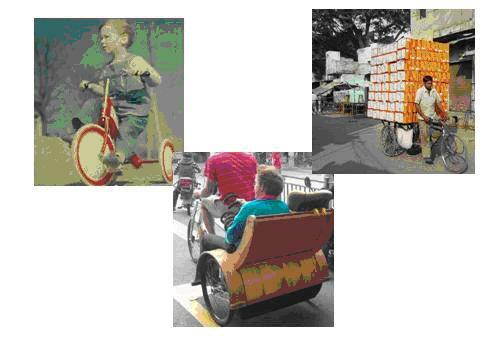 But one of my favourite developments in vehicle transportation is not with a bicycle but a Tricycle (see below picture). Built as part of an advertising campaign for ‘Vim’ Tyre Company in 1898, this Tricycle had the capacity to carry 8 men in one journey! There is a lot more I could say about the bicycle as it really is a fascinating subject that spans technological, social, political and environmental history.…but that would take up another few blogs…at least!